Four o’clock in the morning is as good as night. A few hours earlier I woke up ‘round midnight to see the breeze was up. If the wind were to build, we’d have quite a challenging ride on the broad lake by 6:00! But the harbor lights at 4:15 reveal calm waters. Just after some sounds of movement on deck the Lois McClure, I hear a strange air-sucking sound below the berth I’m borrowing on Tugboat Churchill. It’s the airhorn’s pressure tank filling. As I slowly swing down, trying not to hit the tug’s wheel or operating switches, I smell coffee wafting over from Lois. A very faint gray horizon in the East is backdrop for the marina. By 5:30 we are ready to go, as planned. Gangway up, last use of shore heads, and crews of the Oocher and Churchill are in position to pivot the schooner on the one spring line we’ve left holding us to the dock. Oocher starts but then coughs, floods, takes a few tries and then finally starts back up. We move off the dock and have to leave the spring line floating in the water as it refuses to flip off its cleat. Oocher will retrieve it in a few minutes when we’re pointed in the right direction. By now there’s a hint of silver in the East. We are the only movement apparent in this small port town, site of War of 1812 events, source of excellent views out on Lake Ontario, and, just as important to the crew, home to two pubs and a bakery. We slide out past Navy Point and then in the gradually increasing light we make ready the arm-thick hawser to switch the tug from the hip to towing position out front. It takes several of us to pay out the giant blue python hand to hand from the stern of the tug to the bow of Lois. Captain Roger swings carefully and nimbly over to Churchill and then Kathleen hands him and Art a bag of food and drink since the two boats will be at a distance for a number of hours. Then we cast off the regular hip lines and Churchill goes ahead on about 175 feet of towline. We all hope for the chance to be released and sail if the wind comes up from the correct direction and has the requisite force – not too strong, not too light. We settle into the necessary roles for a transit: a few on bow-watch, one or two back at the wheel, and others to pick up various tasks keeping the boat shipshape. By 6:30 morning is upon us and we can easily see into the distance. Looking through binoculars we spy what seems to be a grouping of variously colored objects not far off shore. As we near the passage between Stony Point and Stony Island we make out a number of fishing boats, apparently all after the same quarry. What is it they are fishing for? A few hundred feet off our bow a spearhead-shaped fish, white bellied and a good 3 feet long, leaps high out of the water and plunges back in. What was this impressive fish? Lake trout? Muskellunge? Sturgeon? We finally get close enough to one of the 18 fishing boats to yell out the question. “Salmon!” they shout back. We speculate that because of the venturi effect of the narrow, 100-foot-deep channel here, the currents kick cold water up to the surface, bringing coldwater salmonid species with them. Once in a while a monarch butterfly crosses our path, sometimes flying faster than us – are they gathering for the great migration to Mexico? Swells that are never seen on Lake Champlain begin to arrive in groups of four or five as we pass the abandoned lighthouse at Stony Point. 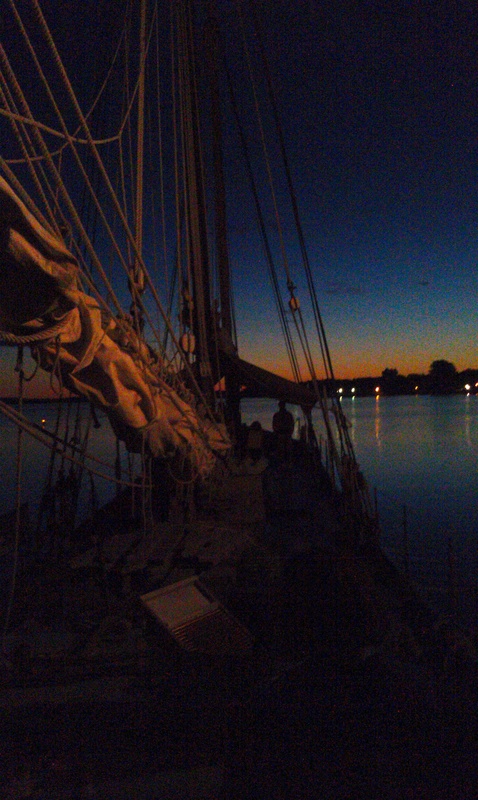 The schooner lurches and heels, making the mainmast stays flop around. We notice this looseness coupled with a somewhat disconcerting half-inch play of the mast in its square tabernacle. First mate Tom Larsen decides to have us cinch the stays together from port to starboard over the boom, which does seem to have its moderate tautening effect. As the sun begins to impart its heat, we catch sight of the towering nuke stack jutting up to the South, a giant plume of steam rising above it. 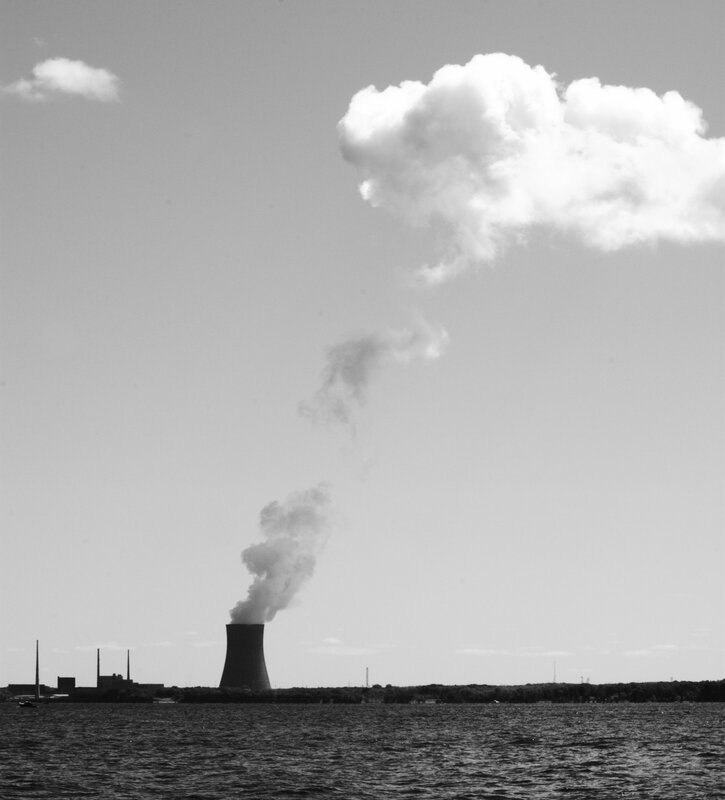 Later we were to learn from a local that many in the Oswego area are lobbying New York Governor Andrew Cuomo to bring a new nuclear reactor to the existing facilities on the eastern shore of Lake Ontario to compensate for the likely retirement of the Indian Point nuke on the Hudson River. To the West, we take in a sight we Lake Champlain sailors rarely see: a vast horizon of nothing but water, as if we were at sea. Below, the water is a turquoise color that recalls the Caribbean. After more than four hours into our journey, intern Carolyn Kennedy is itching for exercise. After making several tours of speedwalking the deck of the schooner (around the foremast in the bow and the cabintop in the stern), several of us do the calculation of how many rounds she’ll need to walk to make a mile – about 40. At 10:15 a.m. she completes her mile and is greeted with cheers. Our other intern Ian Montgomery wonders aloud how far the schooner has gone in the time it took Carolyn to complete her mile – likely much less. The heeling of the boat – caused by increasingly regular swells and our approximate 5-knot following wind – becomes more marked. Belowdecks now there is a regular slish-sloshing of bilgewater and the dinging of the metal centerboard key against the centerboard trunk. Questions arise as to whether or not the fridge or icebox (and other upright boxes) are fastened down. Boxes have been known to topple. As if hearing our thoughts, Captain Roger radios to inquire about the mainmast in its tabernacle. Referring to the stays, he says “Keep ‘em tight,” so we raise and tighten the cinch-lines we have tied on the stays. 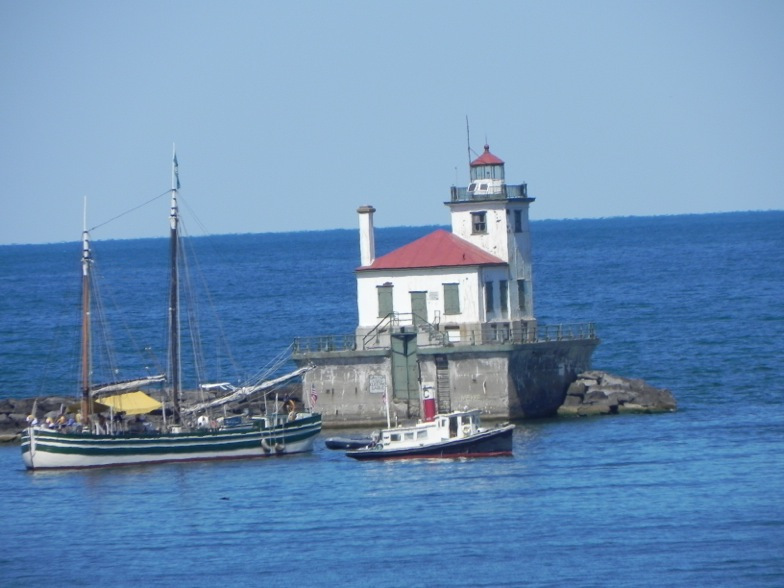 The winds are a bit light to warrant raising the sails, so we continue motoring and arrive at Oswego a little before 1:00 p.m. We shorten the hawser and then enter the inner harbor, passing a boarded-up lighthouse on the end of one breakwater. Ron Wilson, a volunteer at the H. Lee White Marine Museum, greets us from his motorboat, and tells us to dock right between the Museum’s two vessels: a giant grey military tugboat and their new metal-hulled schooner. We ease in slow and take our time tying onto a couple of sturdy steel bollards. Another safe trip for our trio of boats, something we never take for granted but always work diligently toward.